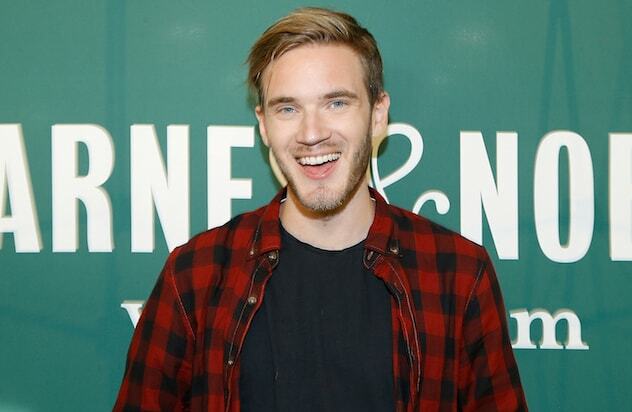 PewDiePie topped the list of the highest-paid YouTube stars of 2016, according to the list released by Forbes on Monday. Also making the top 10 are Tyler Oakley, German Garmendia, Mark Fischbach, Colleen Ballinger and the duo Rhett and Link. In total, the list of the top-10 most lucrative YouTube channels earned $70.5 million this year. That’s up 23 percent from the year before. Over the past six years, VidCon has exploded from a simple gathering of video bloggers to an international gathering of the biggest Internet stars imaginable. The show serves as both a trade expo for people in the industry and a chance for fans to come face to face with the people behind their favorite YouTube channels. From gamers to comedians to animators and beyond, here are some of the biggest stars at this event. Tyler Oakley has become the gold standard among bloggers, racking up over 8 million subscribers with videos of him and his friends doing silly things together on camera. He's also become one of YouTube's leading LGBTQ activists, throwing his support behind the Trevor Project and recently posting a video discussing the Orlando shooting and how the LGBTQ community can move forward. Mark "Markiplier" Fischbach rose to prominence with his Let's Play videos, cracking jokes in front of a camera while playing PC games. His biggest claim to fame is are his playthroughs of the "Five Nights At Freddy's" series, which left fans rolling with laughter thanks to his panicky attempts to beat each game. Anita Sarkeesian's "Feminist Frequency" has become one of the most polarizing series on YouTube, analyzing gender stereotypes in video games and critiquing the treatment of women in video games and the culture surrounding them. Born in Ontario to Indian immigrants, Lilly Singh turned her family into the inspiration for a series of blogs featuring caricatures of typical Indian parents. In February 2016, she released a documentary called "A Trip To Unicorn Island," documenting the world tour that her YouTube success spawned. If there's anything comedian Mamrie Hart loves, it's a good cocktail. That's why she started the YouTube series, "You Deserve A Drink," where she gives her viewers the funniest mixology class you could ever imagine. While YouTube has becoming predominantly live-action, there are still some animators making a name for themselves. One of the most famous is Jonathan Picking, a.k.a. Mr. Weebl, who created beloved classics like "Magical Trevor" and "Breadfish." Henry Reich is the creator of the MinutePhysics YouTube channel, which has become one of the most popular science shows online. Using simple animations, MinutePhysics explains the most well-known concepts in physics and answers weird viewers questions, like how long it would take to fall through the Earth. There might not be a YouTube Channel more painful for its stars than Hot Pepper Gaming. The show channels YouTube gaming stars to review the newest video game releases...after taking a bite out of a habanero pepper. Sometimes the habaneros get swapped out for something even worse, leaving the reviewers struggling to talk about gameplay and frame rates. Simultaneously delicious and nauseating, Epic Meal Time is dedicated to cooking up massive meals with a calorie count deep into the five-digit amounts. Take this Chinese Food burger, loaded with chow mein, a patty stuffed with stir fry, and giant egg roll buns. Trick shots with basketballs are popular on YouTube, but Brodie Smith is doing trick shots of a different kind. Smith is a professional Ultimate Frisbee player, and he's become a YouTube star with his insane Frisbee tricks on both land and sea. Kristen Sarah is the host of "Hopscotch The Globe," a travel series that has taken her from Finland to Fiji. When she's not planning epic road trips, she makes videos providing travel tips and a guide to fashion inspired by her adventures. The creators of VidCon, Hank and John Green, have a YouTube history of their own. The two have produced multiple YouTube shows, the most successful of which is the educational show "Crash Course." The show has attracted millions of viewers with its spin on history and science, and has gained the attention of PBS.